The popularity of Python Programming has increased tremendously over the past few years. It has come a long way since it was first released in 1991. Today, the IT industry is making a paradigm shift and many Python jobs are now available to jobseekers. We can easily check this trend from Google Trends. The below graphs shows the popularity of Python programming at all time high in the past 5 years. This obviously leads us to our main topic, i.e., Python programming can lead to your next job. The general purpose ability of Python programmings helps to develop various applications. These application can be websites, data analysis, numerical programming, scientific calculations, AI, machine learning, system programming and so on. 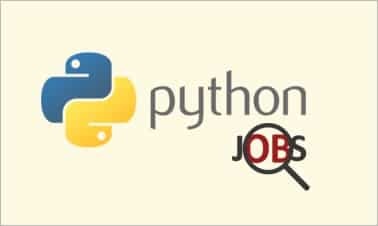 There are various jobs available which needs Python programmers. If you are a job seeker and looking for your a job, then learning Python can define your future career path. The latest job trends in India for Python developer vs Java developer clearly shows the demand for the former is increasing while the latter is continuously decreasing. We at APLC conduct classroom coaching for Python programming. This course is suitable for final year B.Tech. students, first time job seekers and candidates who want to enhance skills for better jobs. According to the data compiled using various job portals, we found that for every single Python job, there are 15 competing candidates. Comparing this to Java job, there are roughly 300 candidates. In short, Python job has 20 times less competition than Java job. Are you ready to make your move to learn Python ?